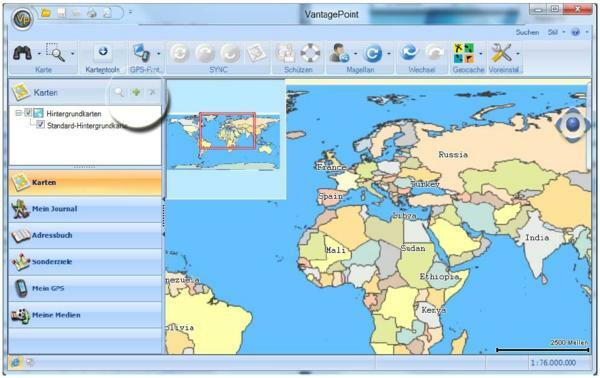 In order to work with these maps on your PC and transfer them to your GPS, you will need the application VantagePoint. You can download it for free on the Magellan website: http://www.magellangps.com/VantagePoint This should be installed prior proceeding with the steps below. The name of the file you download is TOSMD.zip. The map itself can (must not) consist of several map files. In my example Germany is split in three maps: Germany North (TOSMDN1211.imi) , Germany Central (TOSMDM1211.imi) and Germany South (TOSMDS1211.imi). The downloaded ZIP archive contains all three files. 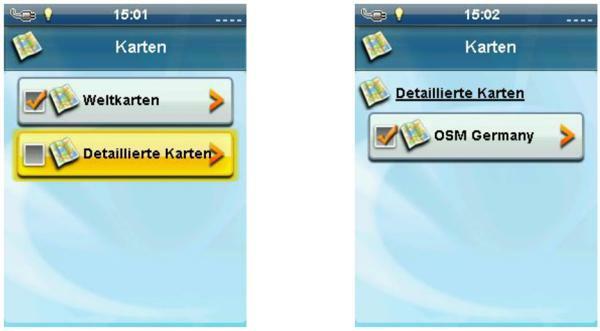 In order to use them you will need to unzip the maps. I am assuming you have downloaded the file to your 'Download" folder. Please start the application VantagePoint . Using the green "Plus" icon, you can add additional map to this application. 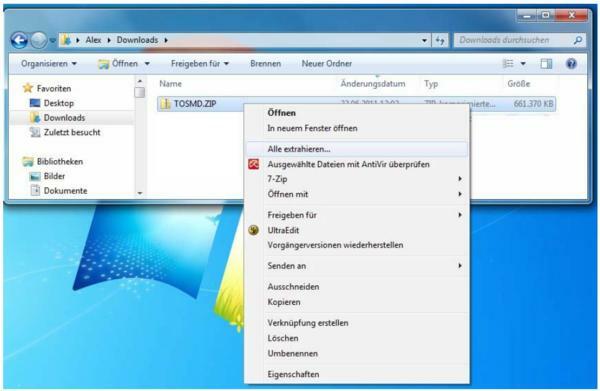 Now please select in the pop-up dialog window the respective files (TOSMD_N0611.imi, TOSMD_M0611.imi and TOSMD_S0611.imi) and approve with OK. The region covered by the map is now shown with a green border. Please connect your eXplorist to your PC and ensure the application VantagePoint is running. 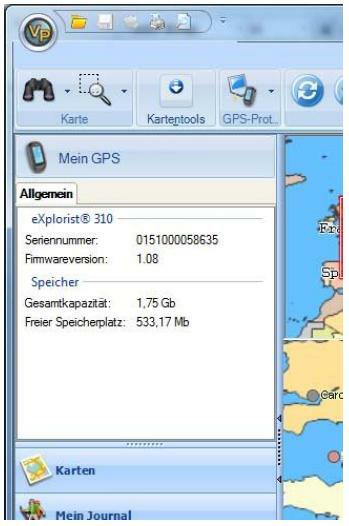 You have established a successful connection of your GPS to VantagePoint, when your eXplorist is listed under "my GPS" in the respective VantagePoint tab. You will also find the firmware version, your serial number and information on the storage capacity there. To now transfer the map, please click on the highlighted map symbol. A map-transfer dialog window will open. Please select the map you want to transfer and click on the blue arrow to start the transfer. The internal memory of the eXplorist 110 and 310 has the capacity of roughly 1.8 GB. The pre-installed basemap and the firmware require around 1.2 GB of this memory. This leaves ~ 600 MB of space on your device. Please do not use all space as you will need storage capacity for geocaches, pictures and tracks. My recommendation is to ensure you always have 100MB of free storage left on your device. This means you cannot install large maps completely and in my example Germany, please only use transfer the region you currently require. PLEASE DO NOT DELETE THE PREINSTALLED BASEMAP! What you can do, is to exchange the basemap with a smaller one. I offer special small (200MB) basemaps, which will allow you to install maps with the size of 1GB+ on your 110/310. If you do this, please read the instructions carefully and ensure you have backed up your original basemap. This map cannot be recovered and Magellan will not replace it. 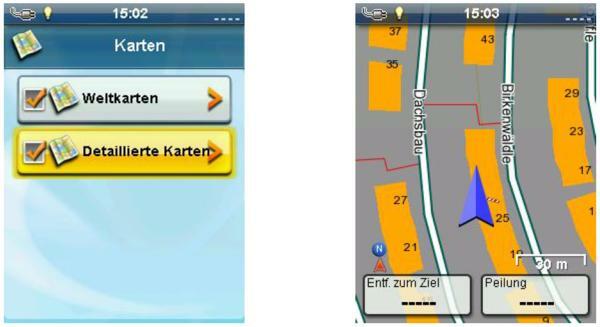 After successful transfer the map is now stored on your GPS, but your device will not display it automatically. You will need to make it the active map first. Press the "MENU" Button within the activated map screen and select "Maps"
Now select in the Map Menu -> Detailed Maps -> OSM Germany (or the respective map name you have installed) and ensure it is checked with the orange checkmark. Navigate back to your map screen. You will need to zoom into high detail of the installed region for the map content to be displayed. If you view it in a higher level (e.g. World overview) you will only see a black border of the installed map. The underlying map data can be very detailled, especially in big cities. If in this case you have selected a high detail level in your "map options" the display of the map or scrolling within this map will take some time. You can improve the performance, by selecting a lower detail level within your "map options". If you use another operating system than Windows or have issues to get VantagePoint running properly, you can always transfer the maps directly via USB to the device. 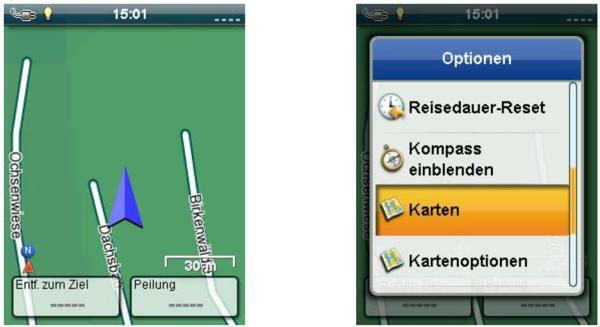 Simply copy the respective map to the /MAPS/ folder on your GPS and make it active as described above.